Two evenings of celebration, and three days of activities, marked the official opening of Trevelyan House as the Trust's new headquarters. 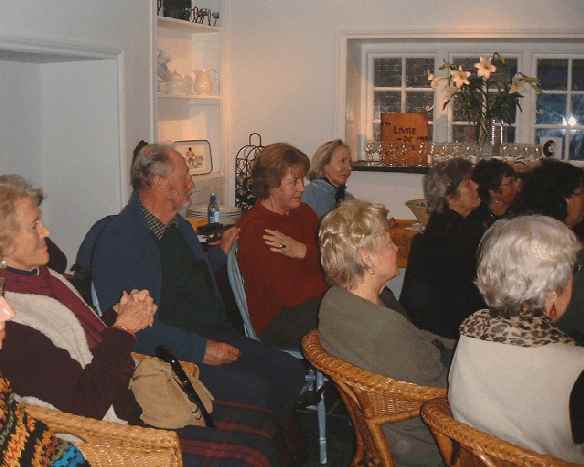 Thursday 28th November 2002 was the quieter of the two evening parties, and was attended by members and guests. They were able to tour the house and inspect the facilities, and enjoy a glass of wine. The new electronic piano was demonstrated by Malcolm Sutton and Julia MacLean. The instrument was purchased following our recent Vivace appeal. Malcolm is currently cataloguing a large collection of sheet music which has been donated to the Trust. Town Crier, Phil 'Piglet' Rowley, was in attendance, and is seen here enjoying himself with Hypatia trustee, Anne Sutton, and Jacqueline McEwan. The morning of Friday 29th November saw the Inaugural Lecture. The London scholar and critic, Eva Tucker, gave a lecture entitled 'The Enchanted Guest of Spring and Summer' - a reassessment of the life and work of Dorothy Richardson. Following a light lunch the afternoon was given over to poetry. Entitled 'The Well-spring of Poetry', it consisted of a medley of talks and poems, presented by Jacqueline Pritchard, Martha Street Pinnons, Jo Pacsoo, Ann Alexander, and Angela Stoner. In the evening we held our Civic Reception, and entertained the Mayor of Penzance and members of the Town Council, together with members of Penwith District Council and Penzance Chamber of Commerce, and the deputy Mayor of Hayle. Master of ceremonies was again Piglet, the Town Crier, and he kept order as best he could. Guests and visitors were welcomed by the Trust's chairman, Heather Rowe. The Mayor of Penzance, Cllr. Ruth Simpson, said how impressed the Town Council is with the sympathetic restoration of Trevelyan House, to become, once more, one of Penzance's most beautiful buildings. She also enthused about the activities of the organisations using the facilities. Professor Charles Thomas, the Cornish archaeologist and writer spoke about the history of the name Trevelyan, and our Member of Parliament, Andrew George, said how much he is enjoying using the premises already for his 'surgeries' for constituents. During the evening we were entertained by 'polite jazz' from The John Cox Quartet. A presentation was made to Hedi Saunders, our hardworking voluntary administrator, and she was thanked for all the effort she has put into the project. 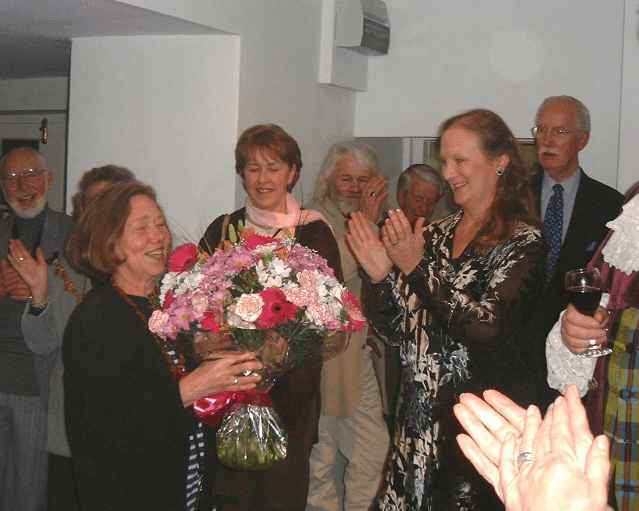 She is seen here, on the left, receiving a bouquet of flowers from trustee, Anne Sutton, and a round of applause from everyone. On Saturday, 30th November, we were open all day for visitors and friends. We held a book sale with some local book dealers attending, as well as raising money by selling some of our duplicates. Book launches were held by Andrew George, Catherine Wallace, Ann Alexander, Alexandra Pratt, Mary Casling, and Jim Hosking. On the afternoon of Sunday, 1st December, there was a film presentation and discussion, entitled 'Speaking for themselves: 7 women and their experiences with cancer'. The visiting presenter was Gesine Meerwein from Freiburg, Germany, Women's Archive. We are grateful to the ETS electrical store in Penzance for the loan of a video projector for this event.